Hey everyone! Colleen Clayton, here! Today we are featuring Middle Grade and Young Adult author Rebecca Barnhouse (THE BOOK OF THE MAIDSERVANT and THE COMING OF THE DRAGON). Her new book PEACEWEAVER released this past Tuesday. Historical fantasy at its finest. Sixteen-year-old Hild has always been a favorite of her uncle, king of the Shylfings. So when she protects her cousin the crown prince from a murderous traitor, she expects the king to be grateful. Instead, she is unjustly accused of treachery herself. CC: Hi, Rebecca! PEACEWEAVER is a companion novel to your previous Beowful-inspired novel THE COMING OF THE DRAGON and is set in sixth century Scandinavia. The main character is a young woman named Hild who wants to become a mead server and wants to use that privileged position to "weave peace." Can you explain what a mead server does and what "weaving peace" means and then also a little bit about the character of Hild and her day-to-day life? RB: Like DRAGON, this novel is inspired by Beowulf, although in a less direct way. In the poem, high ranking women have quite a bit of indirect power. One way they wield influence is through the serving of mead. Queen Wealhtheow, for example, brings the mead cup around to the warriors, exacting promises from them. As they accept the mead from her, and drink it, they are implicitly agreeing to her demands. She also reinforces the social hierarchy in her choice of whom to serve, and in which order. Another role women of high rank play is that of the peaceweaver, who is married to an enemy tribe in the often vain hope of bringing about peace. As Beowulf himself says, however, the spear seldom rests, no matter how worthy the bride. Although women may have some influence in the hall, they rarely get much choice about who they will marry, an unhappy fact that Hild discovers. As the niece of a king, Hild lives a privileged life, with fine food, a comfortable bed, and slaves to care for her. Nevertheless, she has work to do: textile work, whether it’s making thread or weaving cloth, is a task women of all ranks shared for much of the Middle Ages. Hild is proud of her skill at the loom, and she enjoys weaving as much as she does riding her horse or spending time with her best friend. All of that is taken away from her when she (oops!) kills a man. CC: This is your third historical fantasy novel, you've also written THE BOOK OF THE MAIDSERVANT and THE COMING OF THE DRAGON. 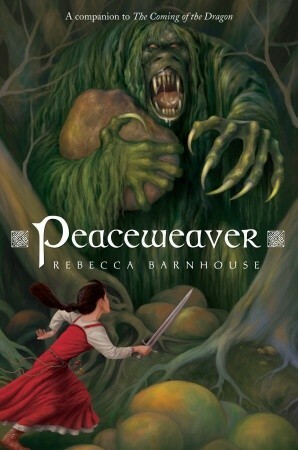 Did PEACEWEAVER present any writing challenges that were different from the first two books? RB: The biggest challenges with PEACEWEAVER came from the fact that it’s a companion book. It wasn’t until after I’d finished THE COMING OF THE DRAGON that I came up with the idea of writing another book about some of the same characters. And it wasn’t until DRAGON was in copyediting that Hild’s story really started to take shape. I was able to change a few things during the copyedits of DRAGON that I knew would be important for the new novel, but after that, I was constrained by what I’d already written. For the most part, this wasn’t a problem. But when the two storylines merged, the challenges presented themselves in ways I hadn’t anticipated. Yet the fact that I was writing a companion book also led me to connections between the two novels that were pleasant surprises. CC: Is there a particular scene in PEACEWEAVER or a line of prose that you are particularly proud of as a writer? RB: I don’t know if there’s a scene that I’m particularly proud of, but the one that was the most fun to write takes place later in the novel when the grizzled warriors Hild travels with are embarrassed to have to tell her how bad she smells. No matter what time period you live in, telling someone else they need to bathe isn’t easy! CC: Thanks for sharing your book with The Apocalypsies and our followers, Rebecca! REBECCA BARNHOUSE lives in Ohio, where she is a professor of English at Youngstown State University. Visit her website at www.rebeccabarnhouse.com. I just read this. Even though I wasn't particularly moved by The Coming of the Dragon, I loved finding out about Hild's part of the tale. The two books are quite a different reading experience because of the differences in the heroes.